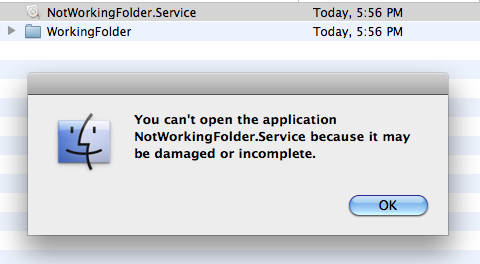 Why does OS X prevent access to a folder if it ends with the word “.service”? I am sharing a win 7 folder and trying to access it from Osx. Everything works but if the folder is named something ending with the words ".service" the folder is not accessible any more, the icon is changed and if I try to access it I get the message below. If I remove the word "service" the folder is accessible again. The machine is hosted inside a VmWare Fusion machine but I don't think this could be a problem, maybe something related to osx-bsd naming for services. As I am working on folders where I can't change the names is there a way to prevent this behavior? I don't think there's anything you can do to prevent it. Not the answer you're looking for? Browse other questions tagged macos sharing vmware . Why does the natd process hog my CPU? Why does a “SAMSUNG_Android” network service keep appearing? Does Fusion (VMware) support 2D graphics hardware acceleration for Yosemite guest OS?